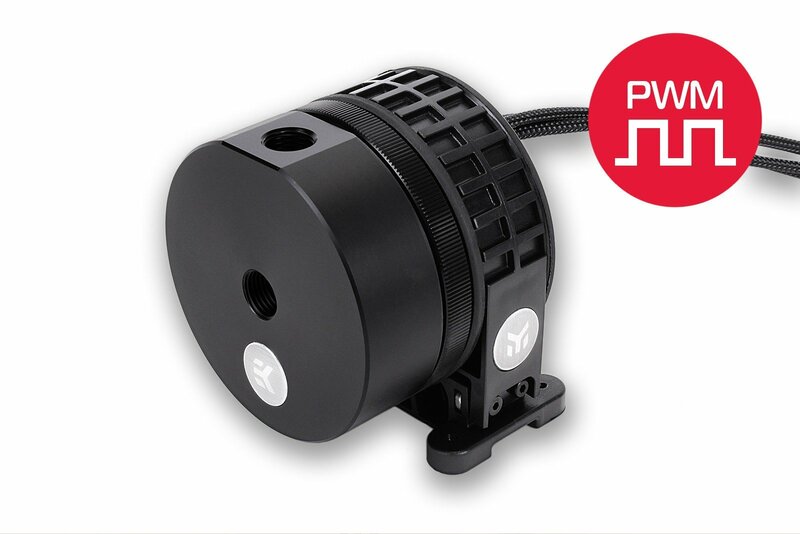 EK-XTOP Revo D5 PWM is a high-performance liquid cooling pump, built around the market-proven Xylem D5 PWM water pump and revolutionary EK-XTOP Revo D5 pump volute / body with revolutionary vibration-reducing mounting clamp. This unit offers increased hydraulic performance (up to 15 %) compared to original factory top. This pump is ideal for PC and other electronics water cooling. The D5 pump is equipped with an electronically commutated spherical motor. The new D5 Revo pump volute / body system features a fully rounded design thus offering greater usability, allowing installation at any angle within 360° of rotation. Special rubber shock absorber is used to de-couple the the main pump body from the mounting clip for silent operation, free of vibration induced noise. Additionaly, horizontal and vertical positioning are supported for easier tube routing possibilities. This pump features a single inlet- (suction) and outlet port (pressure) for installation of two standard G1/4 threaded fittings / barbs. EK recommends EK-ACF series compression fittings. Technical specifications: – Motor: Electronically commuted spherical motor – Rated voltage: 12V DC – Power consumption: 23W – Maximum pressure head: 3.9m – Maximum flow: 1500L/h – Maximum system temperature: 60°C – Materials: Stainless steel, PPS-GF40, EPDM O-rings, Aluminium oxide, hard coal – Power connector: 4-Pin Molex- and 4-Pin PWM FAN connector Operational regime: – PWM duty cycle: ~ 20-100% – Default behavior: Runs at 100% duty cycle when no PWM feedback signal is present Enclosed: – EK-XTOP Revo D5 PWM (incl. EK-D5 PWM G2 pump motor) – Mounting clip with rubber insert – Self-adhesive mounting hole pattern sticker – Mounting mechanism (incl. required Allen keys) – Installation manual Made in Slovenia – EU!